The firm, a subsidiary of Thailand’s Khon Kaen Sugar Industry Limited (KSL), made the offer during a meeting Saturday in Bangkok with community representatives and the NGOs helping them. The 200 families say the loss of their farms to KSL’s two sugarcane plantations in Koh Kong province has driven them into poverty, and they want the land back. But Teng Kao, a representative of the families, said the firm preferred to pay them off. Mr. Kao said KSL also suggested giving the families new land in re­turn for what was lost, but he was worried it would be far from their current homes. Eang Vuthy, executive director of Equitable Cambodia, who also attended the meeting on behalf of the families, said he hoped their next meeting with the firm would happen in Cambodia. “We want this to happen soon, and we don’t want to delay,” he said. 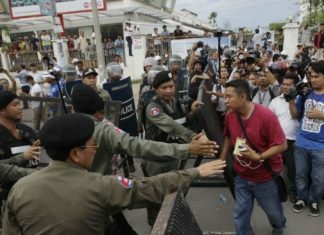 Community representatives from Oddar Meanchey province, where hundreds of other families are in a similar dispute with plantations owned by Thai sugar firm Mitr Phol, also made the trip to Bangkok, but Mr. Vuthy said they failed to secure a meeting. Koh Kong Sugar’s general manager, Thanakorn Burintarachart, who represented KSL at the meeting, did not respond to a request for comment. The meeting with KSL came just a day after the Coca-Cola Company announced plans to carry out social, environmental and human rights assessments of its major sugar suppliers over the next few years, including those in Thailand, where KSL and Mitr Phol are both headquartered.